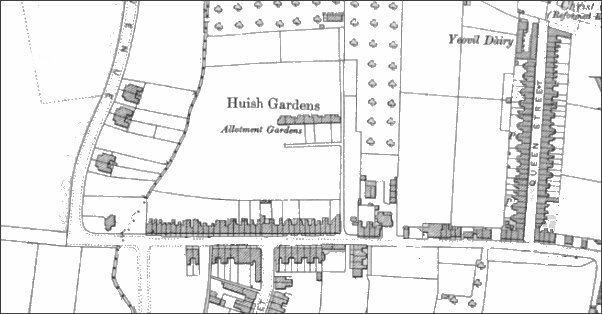 Huish Gardens was a small development of seven cottages built between 1831 (they don't appear on Watt's map) and 1842 (the date of the Tithe Map, on which they do appear), at the end of a field called 'In Hewish Field' (Parcel 600) reached by a field access track (present in 1806) running north of Huish and just west of the Beehive public house. In the 1846 Tithe Apportionment Parcel 600 of In Hewish Field it was noted that the houses and gardens were owned by solicitor Edwin Newman and occupied by Silas Griffen. Silas Griffen either acted as a house agent for Newman by letting the houses, collecting rents, etc. or simply sub-let them. The cottages were reached by the narrow field access track which still survives but now leads to Carisbrooke Gardens. Indeed, the track itself appears on later maps as Carisbrooke Gardens. The cottages survive, although heavily restored and extended, in Carisbrooke Gardens. Map based on the 1901 Ordnance Survey showing Huish Gardens at centre and Huish running across the lower half of the map. 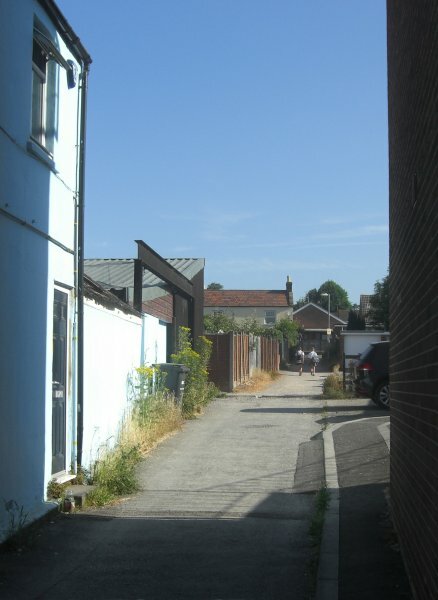 Huish Gardens lane seen from Huish with the end cottage of Huish Gardens, now Carisbrooke Gardens, at centre. This was the former field access track that existed in 1806. Photographed in 2013.